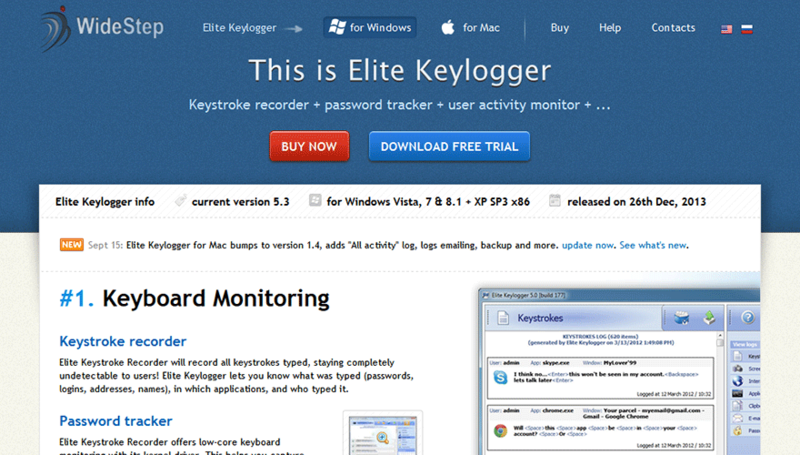 Elite Keylogger is one of the top keystroke logging software around. Its features allow you to detect what’s going on in your computer especially when you’re not around. It’s great for parents as the cyber web is not the safest environment for children. It’s great for employers too who wants to make sure that their employees are not just wasting time browsing over the internet when they are supposed to be working. After all, employers have the right to make sure they are working during working hours because they are paid for their time. Excellent quality keystroke recorder spy software solution. Limited features compared to other more popular spy software solutions. No content filtering provided. No telephone support offered. Undetectable – This spy software is totally undetectable. Only you will have the access to it while others won’t even know the software is up and running. The program can’t be seen in the task manager, registries or even on Windows utilities. 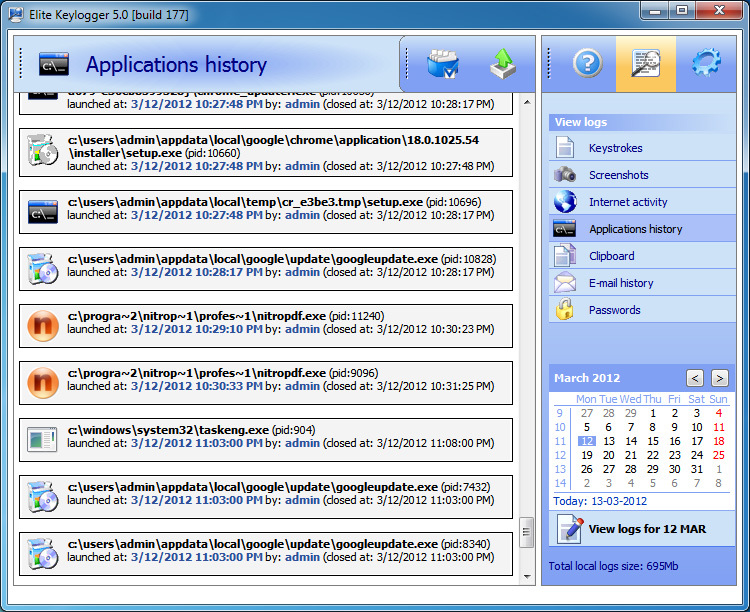 Records All Application Activities – With Elite Keylogger spy software, any application opened on your PC will be detected. You will know when your employee is actually working and using the applications used for their work or when they are starting to waste time playing games. It does not only detect online browsing and online games but even with downloadable game applications even when it is minimized. The exact time when the program is launched, what window caption, and all other details would be recorded. Nothing will slip through your watch. Keystrokes Are All Recorded – Every time someone presses on any keys on the keyboard the Elite Keylogger will detect and record it. Every click of the mouse will also be detected. This is important too especially when they already saved some web pages that can be executed with just one click. If the keylogger only detects the words typed, these things will still be undetected. Chat Detection – Chat messages, even those that are only sent to the user will also be detected and recorded. Every time the user tries logging in to their chat messenger it will be logged from their username and even their passwords as well as their messages sent and received. All types of instant messenger are compatible and will not cause any problem or discrepancy on the details. Secret Screenshots – As part of its features is for taking random screenshots. This is a great feature to make sure that what is recorded by the keylogger is checked with what is visible on the screen. It’s also undetectable so the user won’t even know what screen is being recorded in snapshots as it’s taken randomly. Monitoring Clipboards – Some users are trying to be wise. Once they know there is a keylogger that detects what they are typing, they think they can surpass its detection by copying clipboards and pasting it instead of typing the words. Then they could login or visit sites that they think can’t be detected with the Elite keylogger. But, unfortunate for them, this spy software also monitors clipboards so you’ll know what clipboard they are using so even this won’t slip through your control. Access with Keyword – The Elite Keylogger spy software can only be visible when you type in the keyword. This means that others can’t have any access to it when they open the spy software. This protects you from anyone who will try to delete the logs kept by Elite Keylogger. Logs Sent to FTP or to Email – Even when you are not around, you can still check the logs from Elite Keylogger as it sends the logs directly to your email or uploads it to an FTP server. 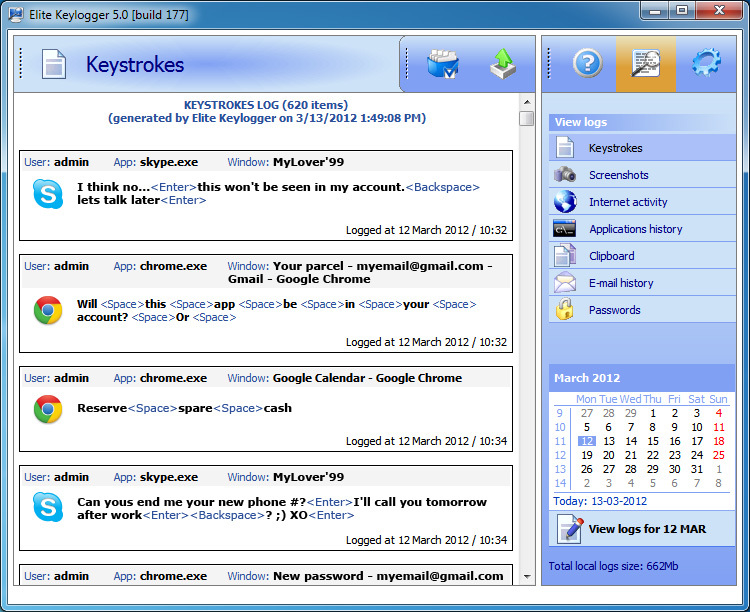 Elite Keylogger is a great tool for parents and employers. With this type of software you can be rest assured that the time spent by your children in front of the computer is supervised. You will know what they are doing even when you are not around. They can’t hide anything from you and this is a great way to make sure that they are always safe. There are many online predators right now who wants to attack children by pretending to be someone of the same age as them then will try to meet up and attack the poor friendly kids. You wouldn’t want this to happen to your own child that’s why Elite Keylogger and similar software are created to be of great protection for them and to give peace of mind to their parents. Elite Keylogger software is perfect to optimize the efficiency of a workplace. Employers will know what their employees are doing during work hours. With this software installed, employees will not try to sneak around browsing through social networking sites, playing games or chatting when they are supposed to be finishing their deadlines. We took a look at their customer support section of their site and they default you to their “All articles” which is basically a web blog about what is happening within the company. If you click the tab “Keylogger for Windows” or “Keylogger for Mac” you’ll find specific help for your product including a search box to use. Widestep does not offer telephone support. If you need assistance, you are stuck with their “Contacts” link at the top of their page which delivers a contact form to fill out and submit.